The contents have been revised and updated in October 2018 to take account of developments over the past year. For example the Hyrvnia (UAH) – USD / EUR exchange rate is now approximately 28:1 / 32:1, respectively; and prices for most goods and services (such as taxis, public transportation etc.) have risen accordingly. Although some of the information is specific to travel in this area, much of it is relevant or can be applied to other destinations in western Ukraine. You may also find additional useful information on various Ukrainian message boards and chat forums mentioned in the Useful Links section (NB: it has not been updated in recent years). One option is to enter through Lviv (also known as Lwow or Lemberg, in former times), which is well served by direct daily flights of several airlines affiliated with the ‘Star Alliance’: for example, from Vienna on Austrian Airlines, from Munich on German Lufthansa Cityline, from Warsaw on LOT Polish Airlines, and from Istanbul on Turkish Airlines. 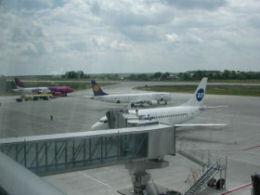 Lviv is also served by Ukraine International Airlines from Kyiv and various other European destinations; and from various German and Polish cities by the discount airline Wizzair. 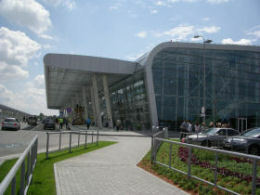 In anticipation of the UEFA football championships, held in Ukraine and Poland in 2012, Lviv airport opened a brand new terminal building. Its gleaming all-glass facades replace the Stalinist-era architecture of its small predecessor, which still stands nearby. Nowadays, all of the basic airport services (check-in, security, customs, baggage delivery etc.) operate very efficiently and you are unlikely to experience delays upon arrival or departure. On one occasion, however, I experienced an unexpectedly long queue at the rather slow security check, due to a number of flights leaving simultaneously in the morning. If you would like to avoid the touts entirely, the regular bus all the way into the city centre will set you back just 5 UAH! The bus stop is situated slightly to the right, across the road in front of the terminal building. Its final destination is the city centre, with several stops along the way at the following streets: Vyhovskhoho - Velykoho - Kn. Olhy - Sakharova - Kopernyka - Doroshenka and Svobody Prospect. I believe there is also a bus that leaves for the central railway station at irregular intervals, so be sure to check as you board the bus. Google Maps is helpful for checking route maps and schedules, even if it may not be completely accurate. A second option for entering Ukraine is through the capital Kyiv (Kiev), which is well served by many international airlines and Ukraine International Airlines (UIA). After a break of several years, daily flights from Kyiv (KBP) to Chernivtsi (CWC) have resumed, flying under the banner of UIA. 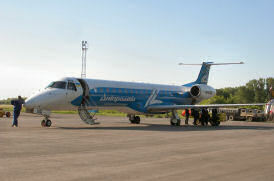 I believe the modern Embraer RJ190 aircraft flying the route are operated by Windrose Aviation. The 1h15m flights are reasonably priced, if booked well in advance. 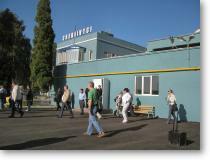 Upon arrival in Chernivtsi, the few available taxis are quickly snapped up by informed locals. While the inexpensive (5 UAH) trolley bus might be an option for getting to the city centre during daytime hours, I would not want to count on this for late evening arrivals. Chernivtsi departure formalities are pretty "low-key". In practical terms, that means you can still arrive at the airport, on the outskirts of town, fairly close to the scheduled departure time. It is advisable to use this service to book tickets in advance, as seat availability may be limited on certain trains during peak travel times. Note also that a printed ticket with only a bar code (not a QR code) needs to be exchanged for a "real" ticket at the railway station, prior to departure. I am advised that this unnecessary hassle, which inevitably involves queuing, can be avoided if the ticket is purchased through the PrivatBank app, which includes a proper QR code in the print-out. I will mention trains departing from Tovste only briefly, since purchasing a ticket for the return journey is not for the faint of heart. Normally, one must have a ticket in hand to get on the train. There is a ticket booth on the ground floor of the small train station, but it opens for only a short time at unpredictable and highly irregular hours. There is also a small signaler's (?) office on the second floor which seems to be staffed 24/7, where one can go in desperation to try to find out when the ticket booth might possibly open. Once, when the ticket booth did not open at the appointed time, I found myself waiting for a train departing after midnight – my only way of getting to Lviv to catch a flight – with no ticket in hand. Fortunately, a young Ukrainian found himself in the same predicament and we managed to locate a conductor who let us on board. The whole drama played out in less than two minutes – the duration of the train stop in Tovste – but hauling luggage down a railway track in total darkness, in the hopes of finding the one car with a conductor on duty is not recommendable. Normally you share a train compartment with other people, especially since the Kyiv-Chernivtsi route is heavily frequented. You might use the opportunity to strike up an acquaintance or simply travel undisturbed, minding your own business. Apart from the occasional case of overly exuberant travelling campanions, well-supplied with beer, I have never had a bad experience traveling with other passengers, taking normal precautions with valuables etc. A couple of decades ago, when the trains were inexpensive and much less frequented, I opted to pay for the whole compartment when I was traveling with family or when I wanted to be able to spread out papers to work; but this "extravagance" might not be so easy to arrange these days if the trains are travelling at capacity. In general, the quality of bus service has improved markedly in recent years, as most of the older buses (pictured here) have been replaced by more modern ones. 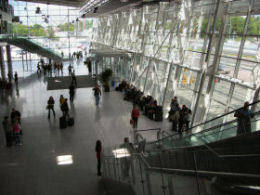 Some international flights from Lviv depart early to mid-afternoon, and it can be a challenge to reach the airport from Tovste on the same day. Excluding the option of hiring a private taxi all the way from Tovste to Lviv (a journey of about 4 hours), a good compromise is to take a taxi or bus to Ternopil and from there catch an inexpensive train the rest of the way to Lviv, as mentioned above. 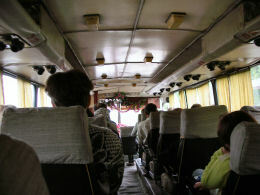 Driving time by taxi directly to the train station in Ternopil is about 1 ½ hours. (The bus takes about 2 ½ hours and terminates at the main bus station, which is about a 10 minute bus or taxi ride to the train station.) 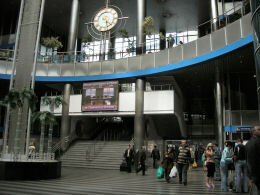 From there, regularly scheduled trains depart for Lviv throughout the day, starting from about 06:00. Journey time is just over two hours. As mentioned above, the Deutsche Bahn and Ukrzaliznytsia websites can be consulted for a detailed schedule. Once you reach Lviv train station, a 100 Hryvnia taxi ride will have you at the airport in 15 minutes. It's not so many years ago that hiring a self-drive rental car in western Ukraine was unusual, if not impossible. 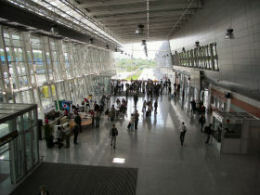 But today, several of the major international rental chains have branches at the airport in Lviv. I have used most of the car rental companies based there, and have found them all to be very professional and reasonably-priced (roughly 30-35 Euros/day for a compact car). As of October 2017, Hertz was undercutting the competition, but this may vary at different times of the year. For any of these car rental companies, it is advisable to reserve well in advance in the months of summer and autumn, since the supply of vehicles seems not to be sufficient to meet the demand during these peak periods. For those who may, justifiably, find the prospect of self-driving in Ukraine somewhat daunting, given the poor condition of many of the roads, another option is to hire a car and driver (who might also be able to offer limited translation service). Typically, the cost of a car/driver from Lviv to Tovste is in the order of USD 85-100 (one-way). I used to take a "scenic" route to Tovste (H09), passing through Rohatyn, Berezhany, Pidhaitsi, Monastyrska, Buchach and Chortkiv (ca. 225 km; 3.5 hours non-stop driving time, when familiar with the route, pothole locations etc.). But by Spring 2018, the condition of the road had degraded significantly (again), making this short-cut much less appealing. In October 2017, I “discovered” the northern E40 highway between Lviv and Pidhirtsi, which has been paved to a high standard. This makes the Olesko-Pidhirtsi-Zolochiv castle route an interesting (albeit longer) alternative to the H02 highway between Lviv and Ternopil. The latter, which used to be poorly maintained in some places, has since been resurfaced and (as of 2018) is in good condition most of the way – making it the most viable option for now. 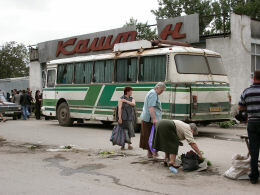 The same cannot be said for the contiuation of the highway, from Ternopil to Tovste, which is presently in rough shape. Notwithstanding these inconveniences, the Dvir Guesthouse remains the only option readily available in Tovste, and it avoids the long journey to/from Chernivtsi. A decade ago, I found a couple of other alternative accommodation options in nearby Chortkiv, about 20 km to the north: Hotel Tanya (03552 22755); Hotel Avianosez (03552 21830); and Hotel Hetman (03553 31284). I know nothing about the first two, but I did visit the Hotel Hetman, which had clean rooms, with shower/toilet. It is situated only about a 5-10 minute walk from where the bus stops on its way to Tovste. There may well be other alternatives of which I am not well acquainted, which have sprung up in recent years. These include a brand new hostel not far from the centre of Chortkiv, with shared kitchen and bathroom. Changing money in Ukraine, even in small towns, is transparent and very easy thanks to the large number of exchange outlets. There is no need to exchange money before travelling to Ukraine. Banks and small money changers use billboards to advertise the exchange rates for dollars and euros, which may fluctuate from day to day. What you see is what you get – there are no hidden commission fees. Generally speaking, there are only small variations in rates from one exchange outlet to another on a given day, except perhaps at airports and train stations, which might not offer as good a rate. This is especially true of the exchange offices at Kyiv Boryspil Airport: do not bother exchanging money there unless you have no other option. 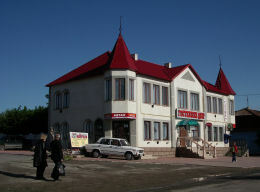 Tovste no longer has a branch of PrivatBank in the center of town. Only an ATM remains, and it's easy to miss because it is located on the main street (west side) up a flight of stairs. However, it’s possible to exchange money at the state Oshad Bank, which occupies a nondescript building opposite the "Grave of the Virgin Mary" monument. Kyivstar and Vodaphone are the two main competing mobile services. The per minute calling charge isn't cheap, but the convenience of making/taking a call from just about anywhere in the domestic network makes it worthwhile. From my experience, Kyivstar has much better internet coverage, especially outside of large cities. Its SMS messaging service is also very handy. The Kyivstar SIM card even works for SMS while travelling in many countries outside of Ukraine (eg. in western Europe and perhaps even further afield). Tovste is fortunate to have an exceptionally good signal for internet, which works very well for pre-paid Kyivstar internet packages. If you are thinking of using a public lavatory before heading off from the railway station in Chernivtsi, think again. I'm not sure if the situation has improved since I last visited around 2009, but the almost surreal public toilet in the basement – possibly constructed in the early 1900s and, by appearances, not upgraded since then – ranked as one of the most abominable on the planet.